Unlikely to be seen in XPS unless implanted into samples. 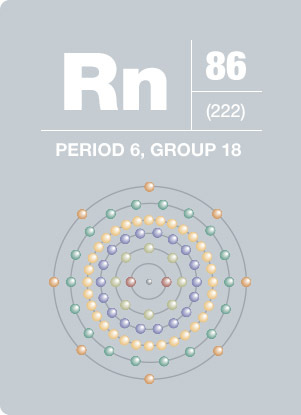 Radon, the heaviest of the gases, was discovered in 1898 by F.E. Dorn. Colorless at standard temperature, radon exhibits brilliant yellow phosphorescence when cooled below its freezing point and becomes orange-red as the temperature is lowered. This element is formed by the natural breakdown of radium, a decay product of uranium commonly found in the earth’s crust. Radon can also be found naturally in some spring waters. As a radioactive gas with a short half-life, radon forms decay products that damage lung tissue when inhaled, making the element a major health hazard.